After all the rumors, Apple has finally confirmed a special press event on Tuesday, October 22nd, in which it is expected to unveil plenty of stuff. At least that is what we learn from the beautiful invitation the company has just sent. 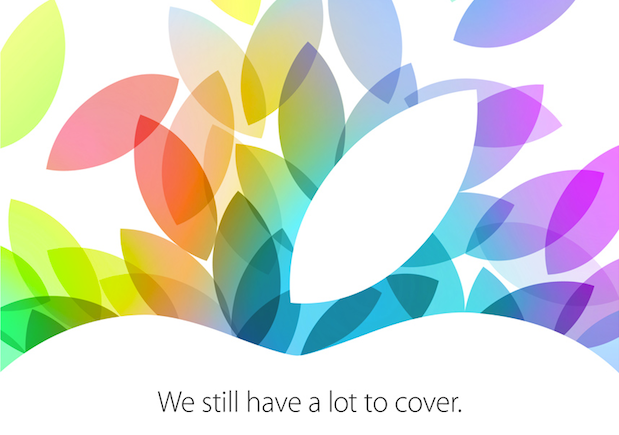 Which leads us to the question: What exactly is Apple going to reveal during the company’s next event? Well, we already covered the new iPhone 5s and iPhone 5c last month, so we can get them out of the way for now. And yet, there are so many possible options on stake that it is extremely hard to predict or assess. One thing is almost certain though, we’re now very likely to see a new iPad 5, the latest and greatest from Apple’s full-size tablet (9.7-inch). There’s also a good chance we’ll see an iPad mini with a Retina display, or even a new MacBook Pro, and a fourth iteration of the Apple TV label. A rumored iWatch that Apple is probably working on is not likely to show up this time, but I guess there could be an optional keyboard cover, as the tagline implies. We’ll be here day in and day out to cover it live.